Let me start be telling you whoever decided that a layer of pretzel crust followed by cream cheese and strawberry jello a salad was an absolute genius! Mostly because whoever made that decision somehow made what might normally seem like a dessert be an acceptable side dish at BBQs and potlucks my whole childhood. It was always one of my favorites and it seemed to make regular appearances during the spring and summer months. I was always disappointed when a pan didn't make an appearance on the table. So I have been thinking about making some lately. I couldn't let the summer get away without having some. But you know me, I can't leave well enough alone. So I went to tinkering. If you have been hanging around here lately, you know I am going through my creamsicle phase lately. I want everything to have that mix of bright orange citrus and creamy vanilla. 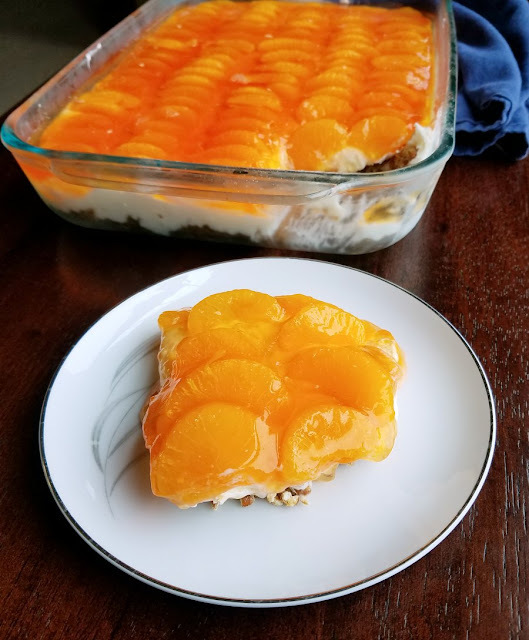 There was the orange creamsicle cheesecake ice cream, orange creamsicle jello salad, and the orange creamsicle no bake cheesecake. 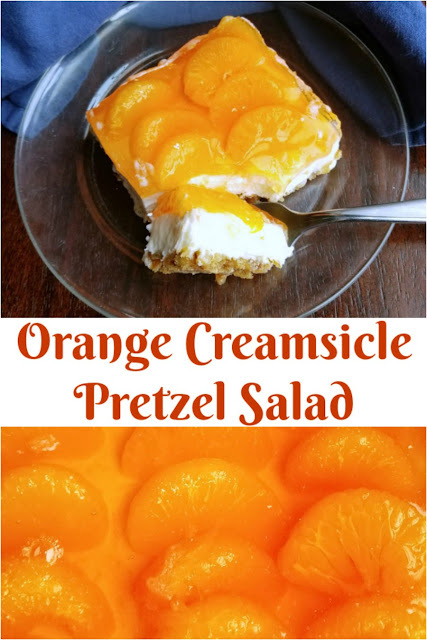 So of course I had to put an orange creamsicle twist on that pretzel salad I loved so much growing up. I did make a few changes besides the basic flavor of the top layer. 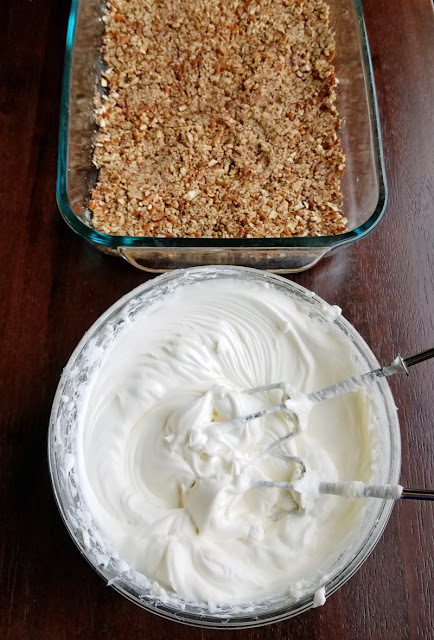 Instead of using cool whip, I mimicked my favorite no bake cheesecake filling which is fluffy and delicious and made of just cream cheese, cream, sugar and vanilla. The little mandarin orange slices are always a hit at our house as well, so I loaded it up with them. No smattering of oranges for us, we wanted orange in every bite! I delivered the finished "salad" to my parents' house. My brother made char siu (the real pork on a stick kind, not our chicken version) and fried rice. This kick of citrus was the perfect little sweet something to go alongside all of that goodness. Everyone was a fan and now I don't know which version is my favorite, the strawberry or orange. I guess we'll just have to keep making both until we can make up our minds! Place crushed pretzels and sugar in the bottom of a 9x13" pan. Melt the butter and pour over the pretzels and sugar. Mix and spread over the bottom of the pan, pressing slightly. Bake for 15 minutes and then remove to cool. In a stand mixer, or a mixing bowl with a hand mixer, beat cream cheese until super smooth. Add sugar and vanilla and beat until incorporated. Slowly drizzle in the cream while the mixer is running and whip until the mixture is light and fluffy. Spread over the pretzel crust. Be sure to spread it all the way to the edges. 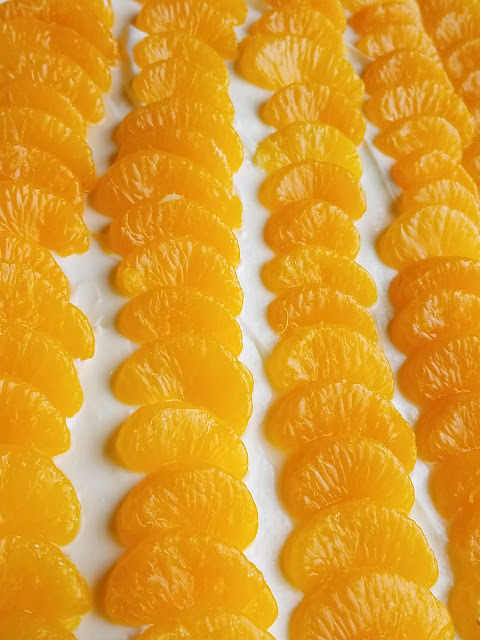 Drain the oranges and arrange slices over the cream cheese. Stir the gelatin powder into the hot water until it is dissolved. Add the ice water and stir until cooled to lukewarm. Slowly pour over orange slices and cream cheese mixture. Refrigerate until set, at least a couple of hours. I love pretzel salads but I have only ever tried pineapple and strawberry. My kids and ME would LOVE this!! Have a wonderful weekend!! I really need to do the pineapple version as you and I share that love! This looks dreamy! It would be a big hit here. It is such a fun twist on the original. Now I want to try more flavors! I absolutely love orange creamsicle. This salad looks wonderful. Me too, they are like a little taste of childhood! 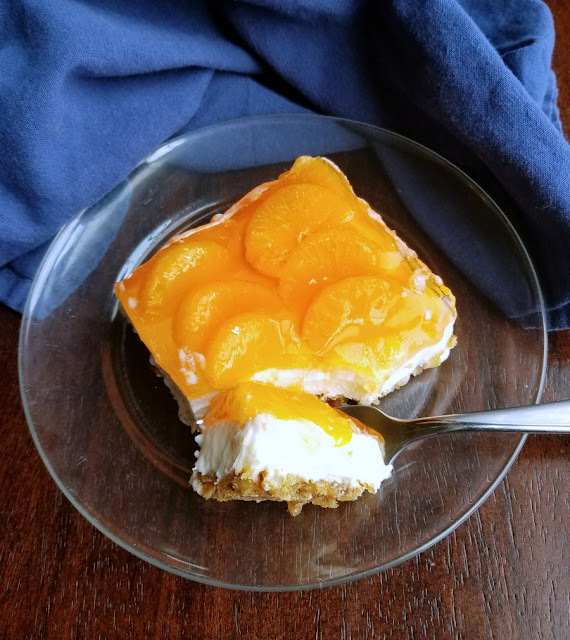 This is a great dessert that we will really enjoy! Hope you are having a great week and thanks so much for sharing with us at Full Plate Thursday! I sincerely hope you do! Thank you! My boys would just love this! They love creamsicles. Pinned. Yay! I hope they do! Dreamy...and thank you, thank you, thank you for not using Cool Whip!!! It's so easy to do it with cream and cream cheese and so good too! Congratulations on the feature at Foodie Friday! Congratulations on the feature at Friday Frenzy. I am making this for our next family get together! Looks so delicious! Carlee, this recipe is perfect for our Labor Day Weekend! It looks so yummy! I featured it at Whimsical Wednesdays Link Party in the Labor Day Recipe section. Thanks so much for sharing it with us!